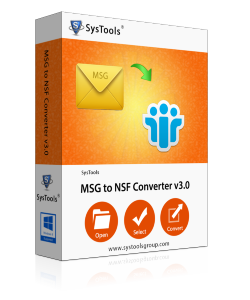 SysTools MSG File to NSF Migrator tool has been designed to move all data from Outlook MSG to Lotus Notes in an efficient manner. It will majorly focus on safe and secure data conversion. The user just needs to launch the software on the local machine. Then, select the required .msg data that needs to be exported into NSF file format. The MSG to NSF Converter software enables the user to preserve the folder hierarchy while accessing the original data during the migration of MSG files. With the help of this application, each user receives the same folder structure as it was before conversion takes place. However, it keeps all the data file to be safe without any fear of data loss & allows users to view msg file in Lotus Notes. Apart from all these features, Date Filter is one of the useful features for all the users who tends to convert msg to lotus notes. With this option, the users allow to carry out a selective conversion of .msg data files. In this case, they just need to provide the date column “From” and “To” that they want to filter. Once it is finished, all messages fall under the certain range will display and the user can convert .msg file to .nsf format easily. Lotus Notes 8.5 , 9.0.1 installation is mandatory for conversion. SysTools MSG to NSF Converter v3.0 asks for a password before exporting. This feature is added to the software panel for ensuring the safety and security of the data. 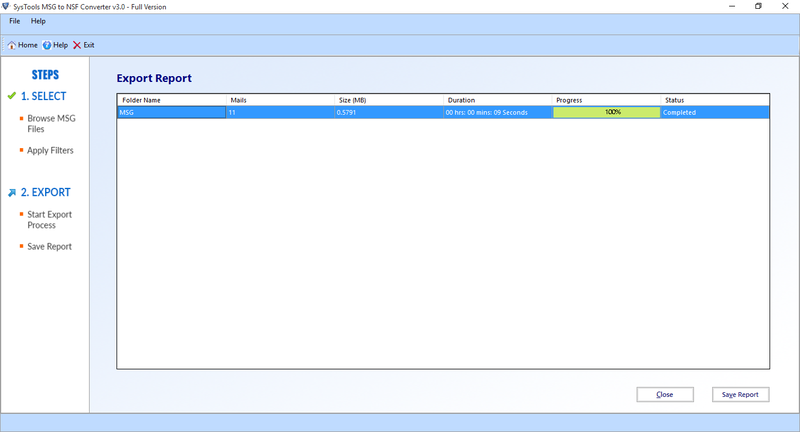 Moreover, after migration the user can generate a complete summary report in CSV file format. Apart from that, the user can save this report in any of the desired location for future purposes. Does the software allow to convert MSG to NSF File data selectively? Yes, Of Course, this conversion tool is capable to move selected MSG files into NSF format using Date Filter option provided within the software. 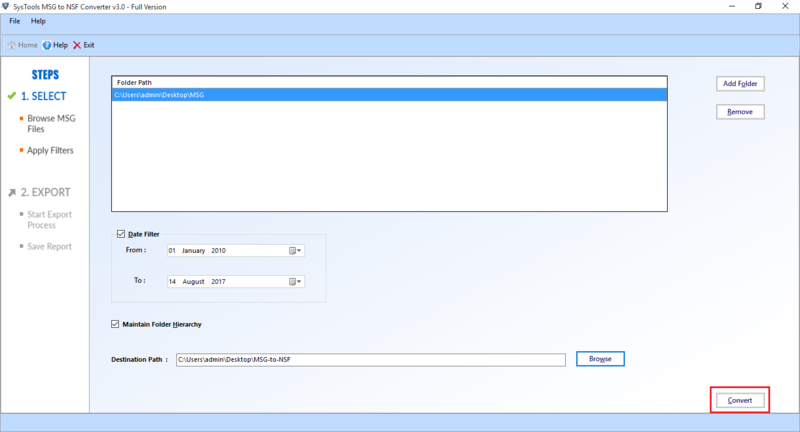 Is it feasible to transfer the Outlook messages (.msg) of a certain date range? Yes, the software offers "Date Filter" option with this the users can select the messages falling under a specific date range. Is there any need to install any supporting environement to perform complete data migration? No, Lotus Notes installation is must to convert MSG to NSF file . Once the Lotus Notes application is installed in a system the users can easily move all data in .nsf format. Can I save the final report of the entire process in any of the desired location? Yes, the MSG to Lotus Notes NSF Migrator tool allows the user to save the completing report in any desired loication without any data loss. Does this MSG File to NSF Converter tool retain the folder structure when I view msg file in Lotus Notes? Yes,our Migrator tool helps to preserve the folder hierarchy throughout the entire migration & allows you to open .msg files in Lotus Notes. I have multiple msg files that I have stored in my hard-drive. Does this tool support to import MSG into Lotus Notes? Yes, this tool supports to import multiple MSG file at once using Add Folder Option with the software Interface of the Tool. After using SysTools MSG to NSF Converter I must suggest this tool who wants to perform a bulk migration. Even I am so impressed with its graphical interface and fast performance to make the data conversion easy. Thanks to the software developers for creating such an amazing and efficient utility. I was looking for the software that can only transfer some specific data of a certain date range. After being thoroughly searched, I came across such a great SysTools MSG to NSF Exporter tool. 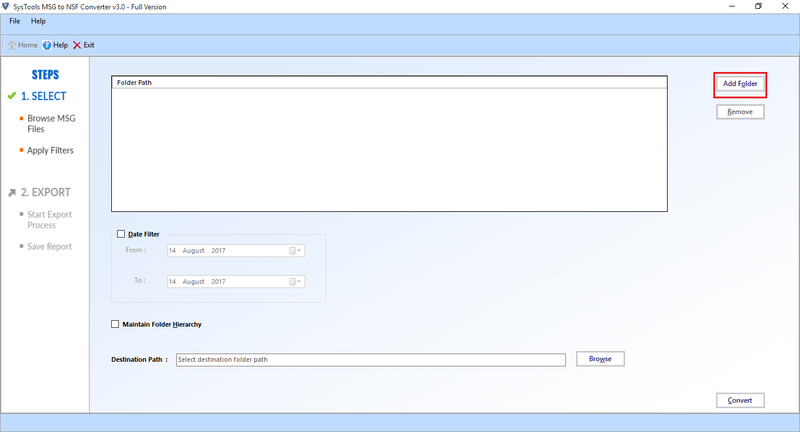 This tool brings various features such as maintain folder structure, date based filter, fill password before exporting. Thanks for providing a trouble-free solution. I cannot even choose one of the best features from this MSG to NSF conversion software. As every feature it has in its panel is very helpful and amazing. I found the user-friendly interface and the most attractive thing about this tool is that it keeps all the data safe and secure during the data conversion process.